TwentySeven: Korakuen – Just Stop and Paint It! One of the Three Great Gardens of Japan is called Korakuen (KÅraku-en). Located in Okayama, Japan, it was built in 1700 by Ikeda Tsunamasa. Korakuen means “garden of pleasure after”, which is a reference to a saying attributed to Confuciusâ€”explaining that a wise ruler must attend to his subjects’ needs first, and only then should he consider his own interests. Once a playground for the elite, in 1884 Okayama Prefecture took Korakuen over and opened it to the public. In 1957 Okayama and San Jose became sister cities. San Jose built it’s own garden in 1965, called the Japanese Friendship Garden, patterned after Korakuen, and in 1966 it’s koi ponds were stocked with koi sent from Okayama. Although koi live over 50 years with some reports of over 200 years, unfortunately in 2009 a virus wiped out much of the koi in the gardens. A video from 1958 of San Jose Mayor Doerr visiting Okayama gives you a little idea of the friendship and culture in years gone byâ€¦. Although I have only been to Okayama twice, just passing through on a Shinkansen (bullet train), the city has become a little more of personal interest to me. My son has been teaching English there in four different grade and junior high schools for much of the past year. He has had a wonderful time soaking in the Japanese culture, making new friends and loving his work, which he calls getting paid to play with school kids all day. 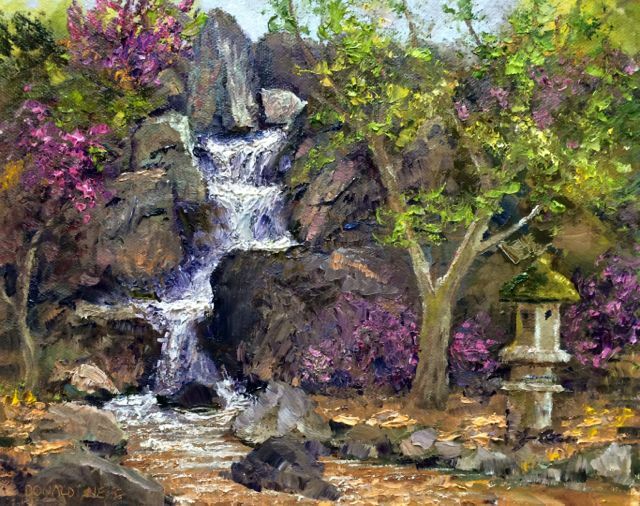 I decided an artificial stream is still a stream, and what better place to paint spring blossoms than a Japanese Garden, so painted the waterfall in the Japanese Friendship Garden. It was a beautiful spring day as the rains had just cleared and there was certainly a freshness in the air! View of a pond in the Japanese Friendship Garden. The basic scene I painted. I painted the scene basically as is, almost entirely in shadow, however added a little more blossoms which were all around me in the garden, except right by the falls. I will be at the Plein Air Convention in Monterey next week, so there won’t be any new Creeks paintings for awhile. I am on the Faculty once again this year, and will be out demoing plein air painting for attendees around the beautiful Monterey Peninsula. I’ll try to do some weblog entries about the convention while there.